Trial Compilation with all pins and technologies specified. The original MKI Analogue Telecom Arbitrary Circuit Generator used an ADI ADSP-21161 device designed onto the main PCB as it's Maths engine. At the time of design, the optimum solution for the above was determined to be the Intel/Altera Cyclone V 5CEFA9F23C8N device fitted on the Arrow BeMicro CV A9 daughter card. Here is a simplistic comparison of some headline parameters for the ADSP-21161 SHARC and the 5CEFA9F23C8N. This project was set out to see what performance could be achieved with a modestly priced floating-point FPGA. As such, there are no absolute values that must be achieved. But there is an expectation that the FPGA solution along with it's faster ADC's and other components should offer both higher-speed operation and provide for more complex DSP capability than the MKI design. In rough terms let's say our expectation is for x 10 speed increase and x 10 DSP complexity increase. To get more DSP work done we either need to do it faster or do more operations in parallel or both, so we can use (speed x resources) as a measure of capability. Without a detailed analysis, this can only be an order of magnitude guide as we need to see exactly how the SHARC cores compare with the FPGA DSP Blocks for the particular DSP tasks needed and even then we will see that there are major factors that affect the simple (speed x resources) model. 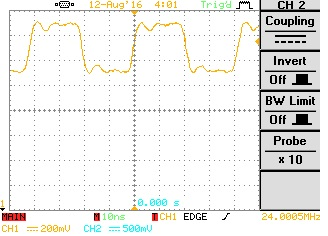 Latency Delay - is important in feedback controller applications. Too much latency results in either poor or completely unstable closed-loop performance. Let's look at the Cycle Latency of the Cyclone V FPGA for a floating-point ADD operation. Again, a detailed analysis of all the DSP operations including Multiply, Signed Integer(ADC)->Float and Float->Integer(DAC) would need to be considered to find the optimum DSP clock rate(s) but, it looks much more likely that our DSP clocks are going to be in the region of 50MHz rather than 200MHz or 300MHz for latency optimization. Now our FPGA/SHARC Capability =(50x342)/(100x2) = 85.5 or 42.75 times per controller channel , which does not look so good for our x100 (speed x resources) expectation. The detailed design of the DSP algorithms and FPGA structures will require careful optimization effort if the x 100 (speed x complexity) expectation is to be achieved. The Cyclone 10 GX promises "2X Higher Performance for Up to Half the Cost" . The Cyclone 10 GX also provides more complex combined operations like multiply-accumulate which may help further with DSP efficiency, but it does have only 192 DSP Blocks (max) available. The Main PCB allows for other FPGA solutions to be fitted. It could be that the Cyclone 10 GX or perhaps 1 off Cyclone 10 GX per channel is the optimum solution to achieve x 100 (speed x complexity) per channel of operation compared to the original MK I design. 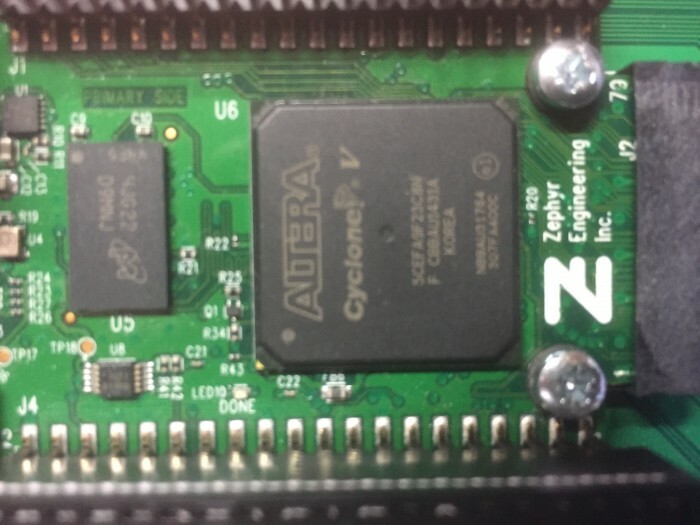 The Cyclone V FPGA is provided as part of the Arrow BeMicro CV A9 daughter card. As such, many of the FPGA and support chip hardware design issues are already covered. The downside to that is that the FPGA card specification was not absolutely ideal. In particular, the I/O voltage standards could not be mixed and additional level convertors were required on the main PCB. But, at around 150 USD for the card, the cost was lower than buying the FPGA device on its own. 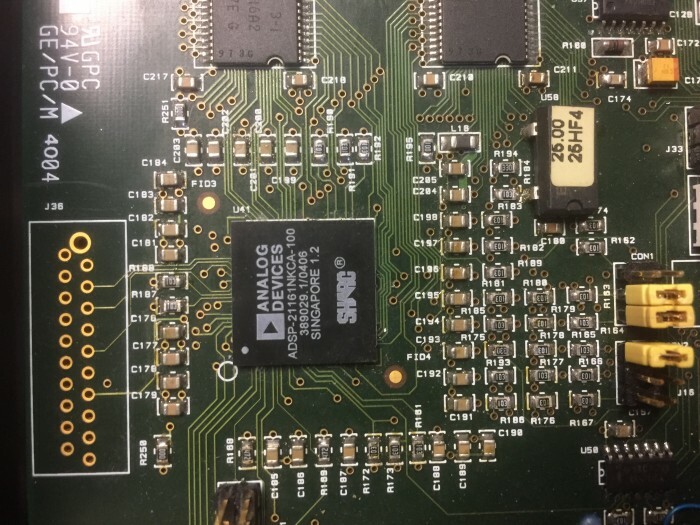 The devices on the main PCB that interface to the FPGA were a mix of 3V3 single-ended, 2V5 single-ended and 2V5 LVDS differential Tx and Rx signalling. The decision was made to set the BeMicro FPGA I/O levels to 2V5 for direct interface to the ADCs and then to provide 2V5 to 3V3 conversion for the other devices. 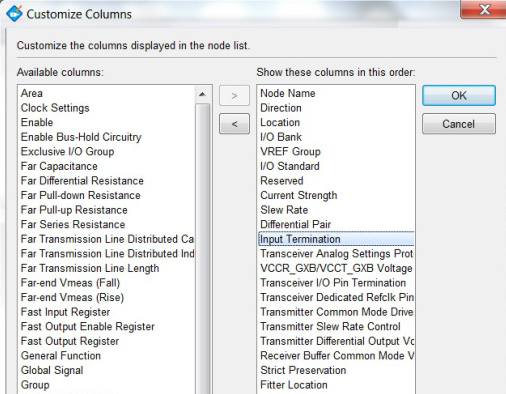 Not all FPGA I/O pins support all the standards so it is important to check for example, that the differential receive pairs that connect to the ADCs along with any desirable specialist resources like serializer/deserializer blocks are actually available on the pins allocated. The differential LVDS signalling needed for the ADC signalling requires 100 ohm terminating resistances at both the ADC end and the FPGA end. The FPGA provides all the termination resistances required as internal components, but, the receiving FPGA termination must be explicitly enabled. This control is one of many pin options that is not obvious on the 1st level of design, but needs to be added from a sub-menu and then set. 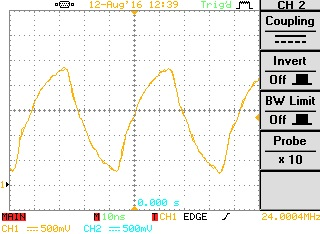 Note - scale is different between scope captures and scope earthing was not ideal. There are FPGA device rules for the allocation of pins which switch simultaneously. The easiest way to check that the requirements are met is to make a trial compilation with every pin defined for the signalling standard along with any pin options and pin operating frequency. A trial compilation with all pins set to the required signalling standard with options and operating frequency will provide a report highlighting any issues. This will detect problems with pins not supporting a particular I/O standard and Simultaneous Switching Noise warnings etc. Here is an example for a floating-point recursive oscillator. Fig 5. Example of a recursive Oscillator with Vendor IP, Random Logic and an FSM. Fig 6. Two Channels are just two copies of the same basic "Channel" design. 1. How many processes should my state machine use, 1, 2 or 3 ? I have for some time opted for the single process solution by default and will continue to use that unless there is some critical situation that demands an extra process. Xilinx Xcell issue 81, page 52 has a nice article by Adam Taylor about the subject. 2. When should I use Signals and when should I use Variables ? As well as the discussion from the Xilinx coding document, the Book “Effective Coding with VHDL” by Ricardo Jasinski also has a good discussion and summary on the appropriate use of signals and variables. USB to UART using an FTDI FT2232H device on a DLP USB1232H Module - Low speed but easy to use for now. Note - The UART for the FPGA was obtained from the OpenCores site. 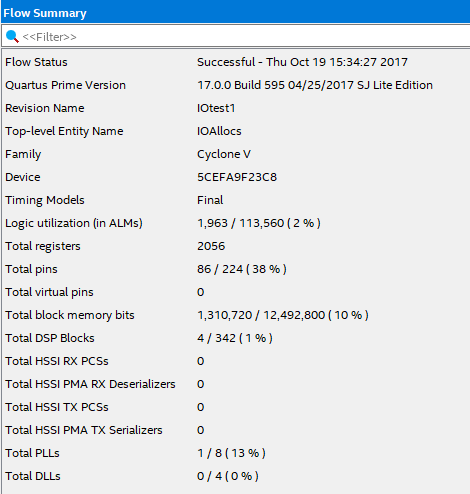 Floating Point Multiplication Example for the Intel/Altera Cyclone V FPGA using the Quartus Prime Lite Development Suite. Fig 7. A simple Floating Point Mathematics Example. The function of this circuit is to take two, signed 16 bit integers, convert them to floating-point, multiply them together and then convert the result back to a signed 16 bit integer. The relevance of this example to the practical hardware is that the unit uses 16 bit DACs and ADCs which operate with 16 bit integer signals. However we do require that the FPGA calculates the complex internal equations, using single-precision floating-point mathematics. Fig 9. Cyclone V Resources used to date. 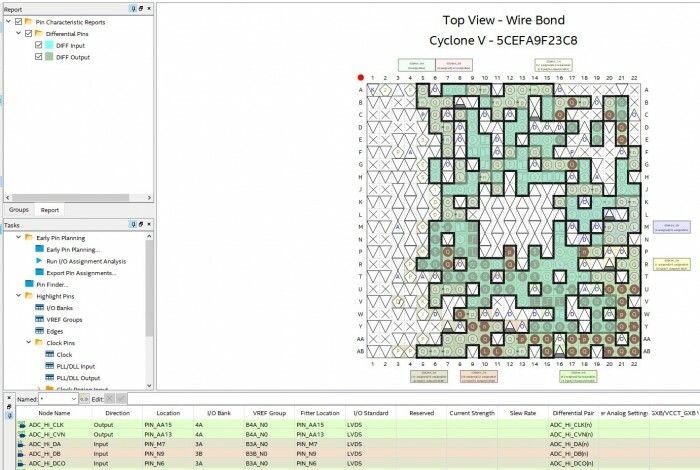 So far, all the required FPGA functionality has been achieved through a combination of original design, open-source code or free-to-use vendor IP. 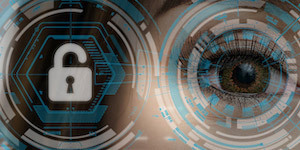 The Intel/Altera Quartus design suite does provide and allow evaluation of licenced IP, for example a Numerically Controlled Oscillator (NCO) which runs whilst there is connectivity to the PC and continues to run for a limited timeout period after the PC link is removed.